When I was younger my sister and I used to go to a local snack shack and get these huge popcorn balls as treats. They were the most beautifully colored treats. I imagine them as the macaroons of the day because of the array of colors that they came in! I decided to figure out how to make them myself because I knew my daughter would love them. They’re basically a round rice krispie treat except in popcorn form! 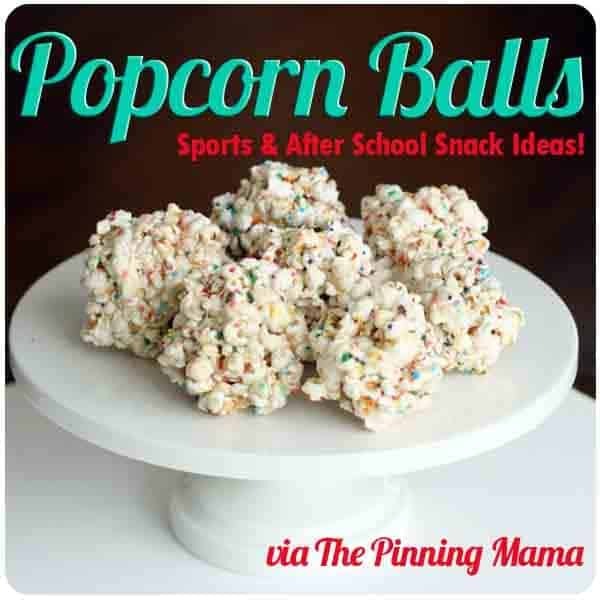 I think these would be such a fun treat for a birthday party, an after school snack or even a fun snack to bring for all the soccer kids after a big game. OR since Halloween is coming up, throw some candy corn in the mix instead of sprinkles! How cute would that be? 6 cups popcorn – microwave or stove top. 2 tsp sprinkles – colors of the sports team would be great! Make your popcorn or scoop out 6 cups of popcorn into a large bowl. In a greased pot or large saucepan melt your butter on low heat. When it has melted, add 16 marshmallows and stir until melted with a rubber spatula. Spraying your spatula with cooking spray is very helpful! Once melted, remove from heat and add your vanilla. Pour marshmallow mixture over your popcorn. Mix with spatula until evenly coated. Sprinkle in your colored sprinkles. With greased hands, roll your popcorn balls. I can usually get 8 decently sized popcorn balls (think palm size). Once balls are formed, place onto a piece of wax paper and let cool and set for 1 hour. 2 tsp sprinkles - colors of the sports team would be great! So glad you posted this recipe! My husband is always wanting me to make popcorn balls for Halloween treats, and I have never had a GOOD recipe. This looks awesome! Thanks for sharing! Thanks! If you make these for Halloween you HAVE to put candy corn in the mix. They’re so cute that way! I love these! They look so cute with the sprinkles – such an easy addition that really adds a punch of color 🙂 Love it! Thank you! Sprinkles make everything so much better. I really want to try m&ms or something next. Mmm can you imagine the chocolately yumminess with salty popcorn. MAN! Yum. YUM!! A popcorn ball and a glass of Chard sounds like a fantastic dinner for Mommy! Do as I say kiddos, not as I do! These will be great for Halloween! I’m sure Hayley and Gabby will love these, we are always popping pop corn, it’s our after dinner snack. If you do any fun mix ins, you have to let me know! I am pretty sure my kids would love those! I will have to give those a try after school one of these days as a treat! You should let the kids help! Just make sure their hands are greased up so the popcorn doesnt stick. I bet they’d love forming the balls! 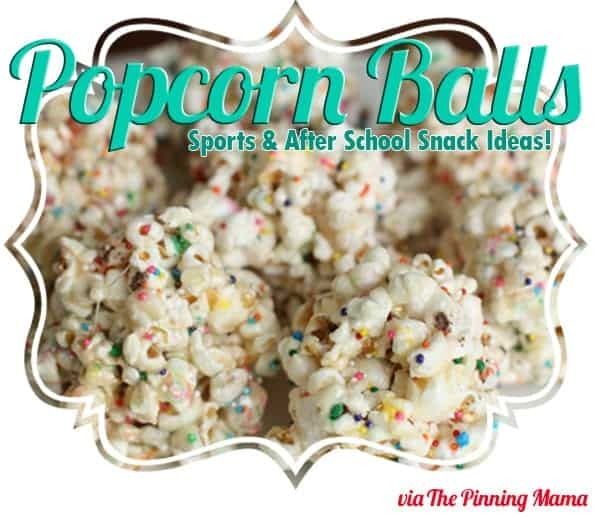 I always tell my kids we should make popcorn balls – this is the perfect recipe to try! Ooh yum, this looks easy and delicious!